Suwalszczyzna is the name of the region that forms the northeastern corner of Poland, adjacent to the Lithuanian border. Blessed with vast forests, transparent water and clean air, it is not in the least surprising that every year the area draws large numbers of visitors. The most and naturally valuable parts of Suwalszczyzna are the Suwalski Natural Park, where you can find the country’s deepest lake, Lake Hancza (108.5 m), and Wigierski National Park with one of the most enchanting of Polish lakes, Lake Wigry. On the shore of the latter stands the 18th century Camaldolese Monastery, where the Pope John Paul II rested during his 1999 pilgrimage. As Suwalszczyzna has the lowest population density in Poland, industry is almost nonexistent. This is obviously one of the reasons contributing to the almost undisturbed nature of the region. Everywhere you look there are beautiful landscapes with innumerable hills, many with sheer slopes, and a number lakes scattered among them. There is no international airport in the region, the nearest airport with an international connection in Warsaw, some 300 km to the south-west of the regions most significant town of Suwalki. The train takes about 5 hours from Warsaw, while it is longer by bus. 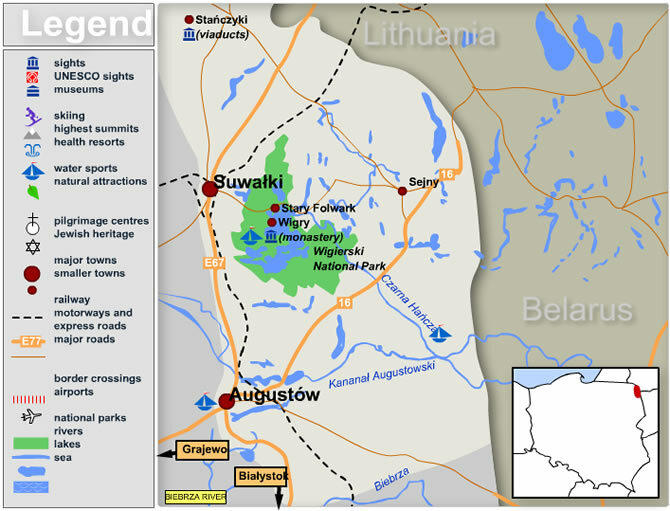 Suwalki is accessible from the following European cities: Tallinn in Estonia, Riga in Latvia and Vilnius in Lithuania. National road 61 runs through the region, linking Warsaw with Suwalki.